While we do have some fathers and sons in the Twin County Hall of Fame including members of the Battle and the Fountain families, in 2016 is the first year that we have inducted a father and son together. The Cheshire family came from Edenton. Joseph senior was educated at the Edenton Academy and later the Episcopal School for Boys in Raleigh. Later, he became of student of law in Raleigh, earning his license in 1836. Although he was successful as a lawyer, his membership in the Episcopal Church led him to pursue a study in theology. After completing his studies under Bishop Levi Ives, J.B. Cheshire Sr. eventually came to Scotland Neck and served Trinity Church for 35 years. He helped build the old brick church that is still there today. In Oct of 1842, while serving in Scotland Neck, he was asked to visit Tarboro and he soon joined the Calvary Parish which he would serve for almost fifty years, twenty of those years shared with Trinity. While rector of Calvary, Rev. Cheshire, not only created the garden cemetery, helped publish the only edition of the Prayer Book of Confederate States, a Southern version of the Book of Common Prayer. He maintained an integrated church before and during the war having services for both black and white members of his congregation. He also married slaves and free blacks in his church, although it was against state law became he believed God’s law was higher than man’s law. He later served on the organization of St. Augustine College in Raleigh and after the war he helped establish St. Luke’s as the first black parish in the Diocese of North Carolina. Joseph has a strong interest in horticulture since he was young and friendship with botanist Moses Curtis led to Rev. Cheshire creating the beautiful gardens around Calvary church. Cheshire married Elizabeth Toole Parker of Tarboro and they had six children, four of which survived to adulthood, two sons and two daughters. His oldest son and namesake Joseph Blount Cheshire. Joseph senior died in 1892, serving as rector for just short of fifty years. Joseph Blount Cheshire, Jr. was born in 1850 and grew up in Tarboro. Like his father he studied law and practiced in Baltimore Md. Before opening a practice in Tarboro. Also like his father, Joseph Jr. felt a calling to the ministry and was ordained in 1880. He was minister at Chapel of the Cross in Chapel Hill, helped establish St. Phillip’s Church in Durham and eventually pastored at St. Peter’s in Charlotte. He also organized St. Martin’s Parish and St. Michael for blacks. 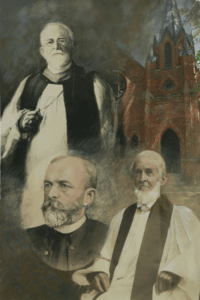 In 1893 he became an assistant bishop of the Episcopal Diocese of North Carolina. Later that year upon the death of the sitting Bishop, Joseph Blount Cheshire Jr. became the fifth bishop of the diocese and the first native North Carolinian to hold that post which he held until his death in 1932. During his ministry he helped establish the missionary district in western North Carolina, led an effort to expand St. Mary’s School in Raleigh. He traveled for the church visiting various churches within the state and participating in national and international conferences including three in London. The Church in the Confederate States which was a history of the Episcopal Church in the South during the Civil War. He was elected president of the NC Literary and Historical Association in 1930 and he was given honorary degrees from the University of North Carolina, the University of the South and Trinity College. Bishop Cheshire married Annie Webb of Hillsborough and they had six children. After her death he married Elizabeth Mitchell of Maryland. Between the two men, they served this state for over 100 years as leading ministers in the Episcopal Church.